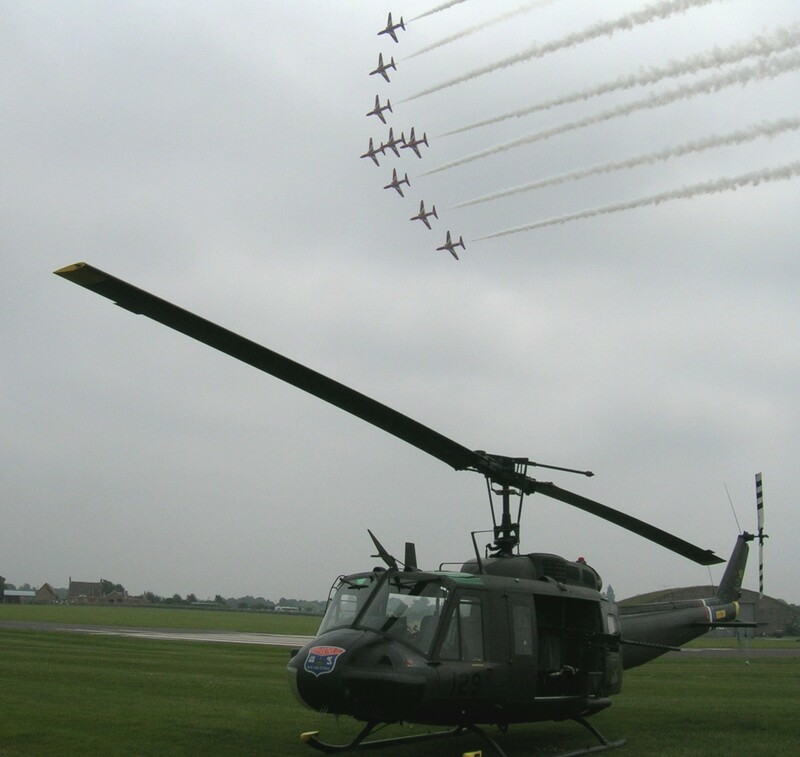 Cosford Air Show was the first appearance this year for 509, but the culmination of several weeks of preparation. Lancashire we thank you for your patience because we put quite a few hours in and no matter what we do we can't do it quietly! of our imminent departure and a call into Cosford to check on the weather. What he heard wasn't good; cloud base was down to 500ft and visibility about two and half kilometres . They advised that we delay our departure and to make contact with Air Traffic Control at RAF Shawbury as they were dealing with approaches. Shawbury confirmed conditions weren't too good and that we would be ok to divert to them if we needed to. With this news it was decided to delay lifting until eight forty five, so we finished securing everything inside the cabinas we had decided we would fly to Cosford with the doors open. At eight forty five the final calls were put into ATC as Rob lit the fire in 509. All checks made, we lifted and headed south. The weather at this point had started to brighten and looked promising. 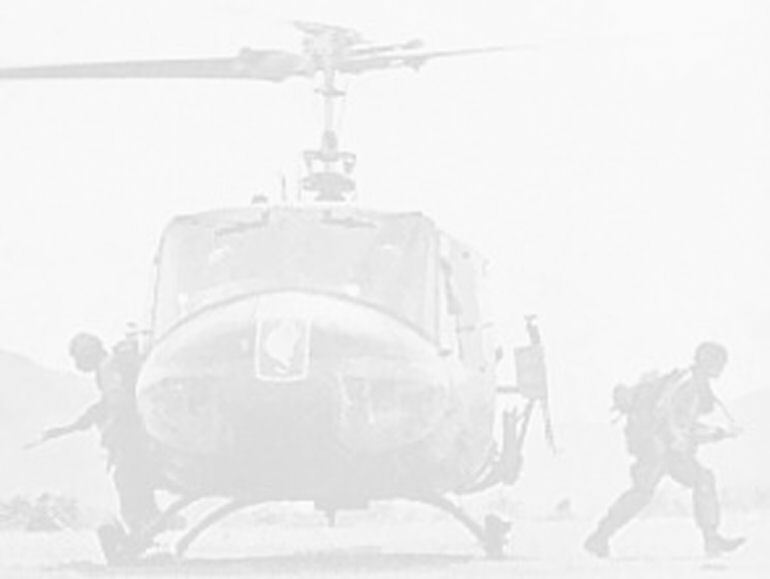 Rob contacted Shawbury Control for an update from them - it was still cloud base at five hundred but rising slightly and visibility around two and a half kilometres. The weather around us wasn't bad at all so we continued south; 509 was flying well and the flight was very enjoyable. Those in the back were amazed at how many people they could see that had heard us coming and were peering up at us. About twenty miles north of Cosford the weather became very changeable and visibility was reduced. Rob slowed us down from our cruising speed of around 100 knots down to 60. The GPS was keeping us on track but Phil was keeping a close look at the map and double checking with visual references on the ground. We were now down to 600 ft just below the cloud base. Rob spoke to Shawbury and they said that we were ok to continue to Cosford. By this time we were following the canal network and major roads to help us to position ourselves. Three miles out of Cosford we saw the road absolutely log jammed with traffic. Cosford Control asked us to take up a holding pattern until they were ready for us to come in. Rob set himself up flying in circles around a roundabout, much to the delight of those stuck in the traffic jam below. 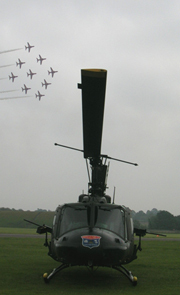 We could see heads popping out windows and sun roofs to see what aircraft was making such a racket above them! After a few minutes Cosford called us in and we approached the airfield. All around the perimeter there were large groups of spectators sat in fields and gardens eagerly waving as we dropped down to fly up the runway to our allotted landing ground. The whole of the flight line was packed with the early birds and the photographers with their enormous lenses. We set down at the north eastern end of runway 24 and proceeded to shut 509 down. A flight that should have taken us 45 minutes had taken us one hour fifteen minutes but we had made it. After the Air Show briefing we were soon prepping 509 for the display. 50 cals removed and other items taken out, the rest strapped down, Rob climbed aboard and sorted himself out. 509 was to follow the display by the P51 Mustang, so as it took off final checks were made and once again 509 was started. By the time the Mustang had finished its display and was coming in to land Rob and 509 were ready for the off. However there was a delay as a couple of Spits of the BBMF came in. 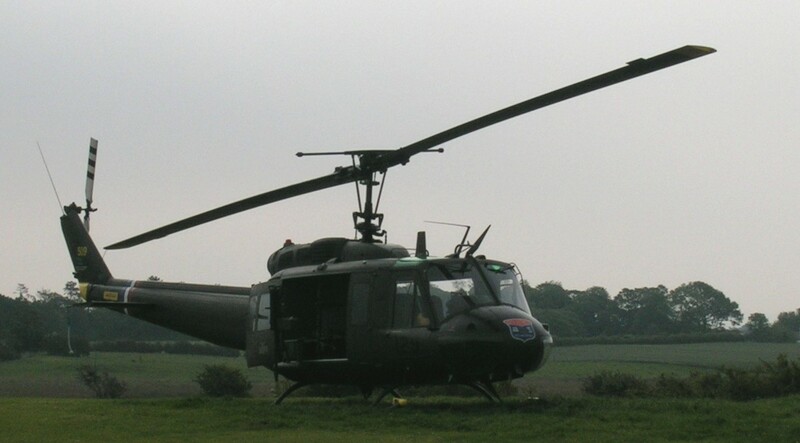 Rob finally took to the skies to dance the Huey around the display line and importantly, for many, to make a lot of noise. It didn't seem like five minutes when Rob came back towards us to land. The display had quite literally flown by. 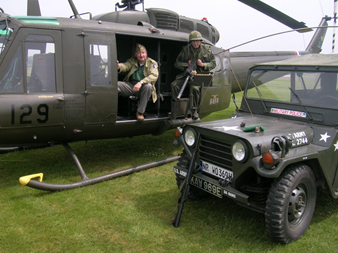 Back on the ground we played host to some members from the Shropshire area of the Military Vehicle Trust. 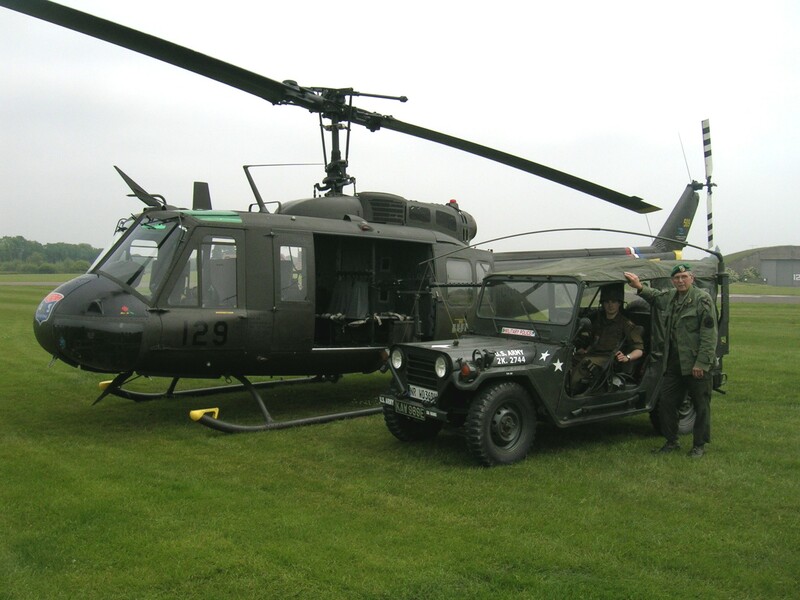 Shortly after we had secured the main rotors, some of their members were allowed across with a Vietnam era M151 Mutt, a descendant of the jeep. We had a close look at the Mutt and they had a good look around the Huey, their faces an absolute picture. Then out came the cameras and loads of pictures were taken with a combination of people in the door gunners well with the 50 cal, and various people sat in the Mutt. By this time the weather was brightening up and the Red arrows were due to make their appearance although their display plans had changed due to the cloud cover. 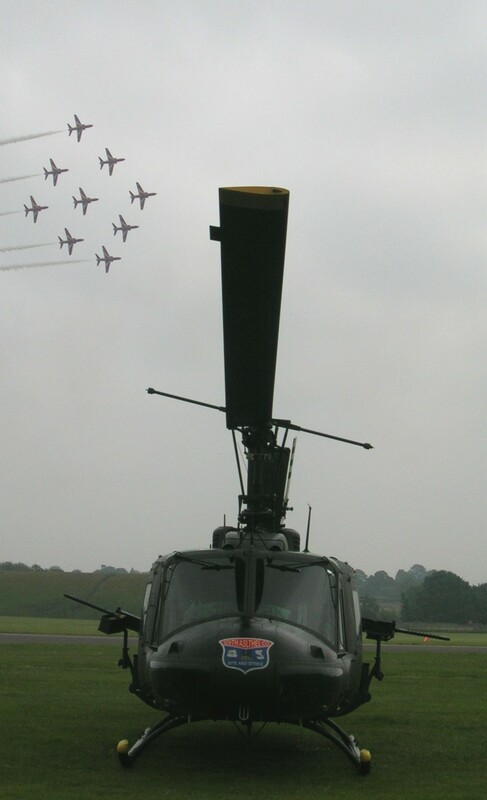 As always a good show was put on by them and as you will see gave us a good photo opportunity with 509 in the foreground and the Reds flying by. 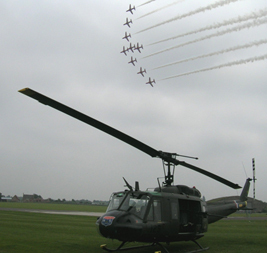 Unfortunately their display was cut short due to an incursion of a microlight into the air space. 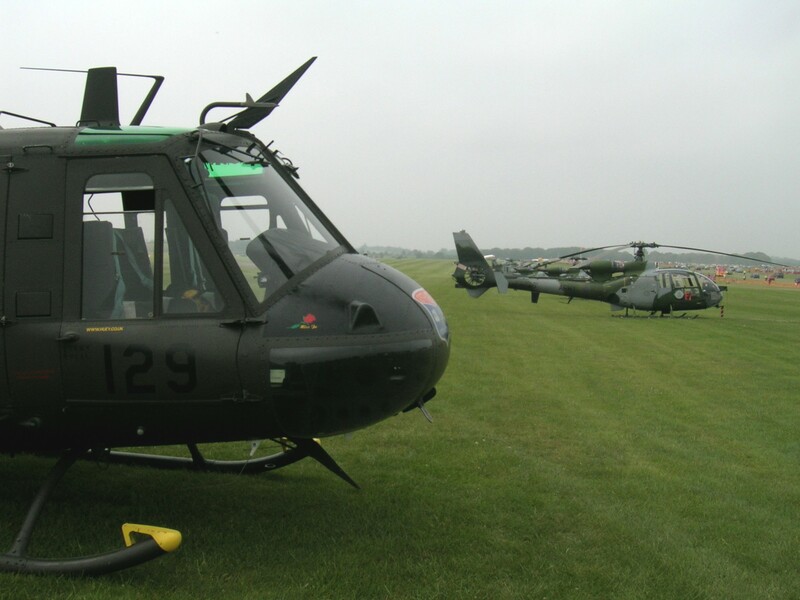 The Huey Team then went on walk about keeping an eye on the various displays, all emerging in time for the finale of the air display which was the RAF's set piece showing joined up operations between Awacks, fast jets, Hercules, Chinook and ground troops. Lots of noise and loud bangs and some very dramatic pyrotechnics. After this the crew returned to the Huey to prepare for departure. Phil was to fly 509 home so he made his checks and once again it was decided to fly with the doors open - well you can't do it very often with our weather so you have to do it whilst you can! Everything secured we were ready for our slot to leave and what a difference a few hours make. We left in beautiful sunshine and clear blue skies. Progress north was much swifter than coming south. Forty five minutes after take off we touched down at base at Blackpool Airport .